Aluminium legs for stability. 32mm snap frames. Anti-glare front sheets. Main panel fits A1 sized poster. 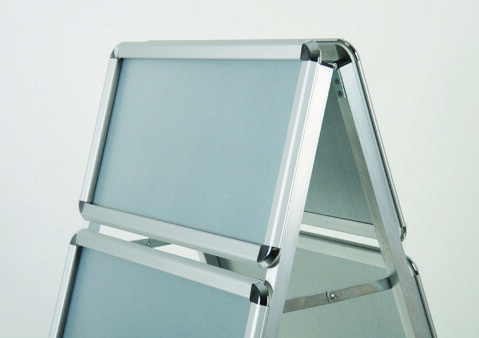 Advertise outdoors with the tough aluminium framed a-frame pavement sign. 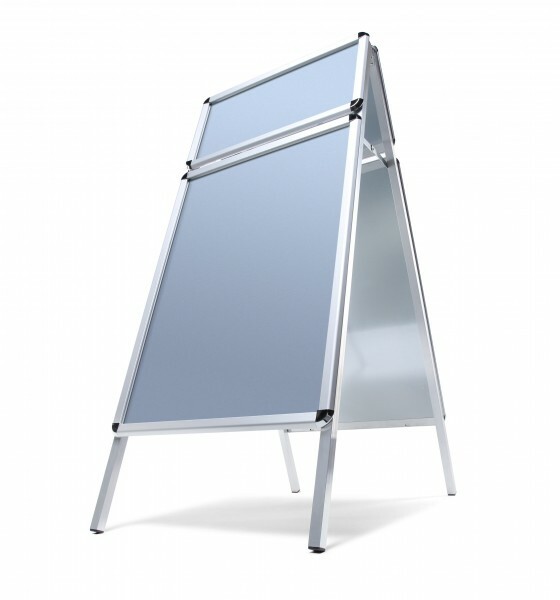 Great for displaying promotional or information based posters, the UV stable anti-glare front sheets protects your posters from fading in direct sunlight. Secure your graphics safely with the easy to use 32mm snap frame system. Double sided for twice the exposure! Use the header panel for your logo or as an extra branding area. Call us today for more information. See our full range of pavement signs. Open out a-frame legs and lock arms into place securely. Open snap frames and insert graphics behind anti-glare front sheets. Close snap frames into place.